Let’s start with a basic truth: We all make assumptions. Assumptions are “corner-cutters.” They save us time from having to ponder every little thing in the universe. We can reliably assume the sun will rise in the east each morning, that spring will follow winter, and that you can’t make a dollar out of ninety-nine cents. If we couldn’t make assumptions, we’d be nuts by noon. But assumptions about the behavior of the sun or the order of seasons are founded on FACT (no Kellyanne, you cannot have alternative facts, now quit your whining). To riff on Neil deGrasse Tyson, the good thing about facts is that they’re true whether or not you believe them. We also make assumptions based on collective human experience: You don’t extend your hand to a snarling dog. You don’t dive into water that’s over your head unless you can swim. You don’t eat the Giant Bag of Hershey’s Kisses and expect to lose weight. Generally wise and good advice, but this is where the slippery slope begins. Collective wisdom slops over into wishful thinking, oozing down from there into a quagmire of pestilence—racism, homophobia, misogyny, nationalism, and other nasty prejudices. Wishful thinking encourages us to believe there are magical, no-fail formulas out there. To assume that if we follow a prescribed set of behaviors, the promised result is guaranteed. For example: Hard work and talent will be recognized and rewarded. We want to believe this because it promises we’ll get the promotion, the contract, the luxe house, and loads of recognition if we just apply our natural gifts and devote our life to the grindstone. But a random stroll through any number of small live-music venues on a Saturday night will show you dozens and dozens of singer/musicians to rival Ed Sheeran or Lady GaGa. Community theatre is bursting with aspiring actors, directors, and set designers who will never see Broadway except from the balcony. And corporate cubicles are packed with dedicated folks who will never get the windowed office in top management. Why? Place, timing, luck—the vagaries of life. Or perhaps they didn’t go to Andover with the CEO. Hard work and talent are good, but they’re not definitive in any individual case. And there’s a dark side to buying into believing they guarantee worldly success. What happens if you pull out all the stops, pour your heart and soul into your work, but the phone never rings, the promotion doesn’t happen, the glowing reviews fail to materialize i n The New York Review of Books? Should you despair that you lack ability? Beat yourself up for not having worked 25 hours a day? For taking time “off” for family, friends, your health? Believing that the big payoff lies entirely within your control makes you the fall-guy no matter how gifted you are or what you’ve sacrificed. So if some or all of the rewards for hard work and talent fall your way, revel in your good fortune, but do the thing you love because you love it, whatever the outcome. Psychologist John Cohen, author of Chance, Skill and Luck, says, “Nothing is so alien to the human mind as the idea of randomness.” Our brain, it seems, continually seeks cause and effect, to the point where we routinely twist two unrelated events into the most far-fetched correlation: I didn’t wear my lucky red shirt today, so of course I didn’t get the winning lottery number. This constant quest for patterns is known as apophenia, and you can actually see evidence of it in magnetic resonance images. Neuroscientists consider this search for cause and effect to be one of our most significant cognitive strengths, but like most strengths, it harbors a weakness: The assumption that everything happens for a reason. Randomness feels threatening, so we employ Everything-Happens-for-a-Reason to explain and mitigate disasters that befall us, both personal and societal. To pair a disappointment or difficult struggle with a happy outcome. We want to believe there must be some positive point to all our suffering. Example: I got dumped by my boyfriend so that I could meet someone better. Well, if your boyfriend was a mean-spirited SOB, hopefully you will meet someone better. The odds might even be in your favor. But you were not dumped by Mr. Wrong so that you could meet Mr. Right. There is no guarantee Mr. R’s in the wings. Whoever you meet next is random, although your decision to act or not on any potential relationship is within your control, and (hopefully) informed by prior experience. Here, that slippery-slope slide picks up a little steam. These are the assumptions we make because our particular culture says they’re true and so we seldom bother to challenge them. For example, the widely-held notion that competition brings out the best in people. That competing, rather than collaborating, puts us on our toes, thus raising our performance. The underlying assumptions here are several: 1) That our drive to best others, to make ourselves look better, is our dominant drive. 2) That our highest achievements are reached when we work in opposition to others. 3) That collaboration stymies top talent by forcing the most capable to work with those of lesser ability. 4) That clever, competent people don’t need help to achieve. Well, look around you. Is this world an example of the “best” that we can be? 1) Developing a solution over time through a chain of individual contributions. The germ theory of disease gained acceptance in the late 19th century, but it was first proposed by Girolamo Fracastoro in 1546 and was advanced by degrees over the next 350 years through the work of numerous physicians and scientists. with other famous linguists and Egyptologists, such as A.I. Silvestre de Sacy, who both taught Champollion and tipped off Young that cartouches might be an interesting place to look. Our penchant for competition is strangling the world on many fronts. 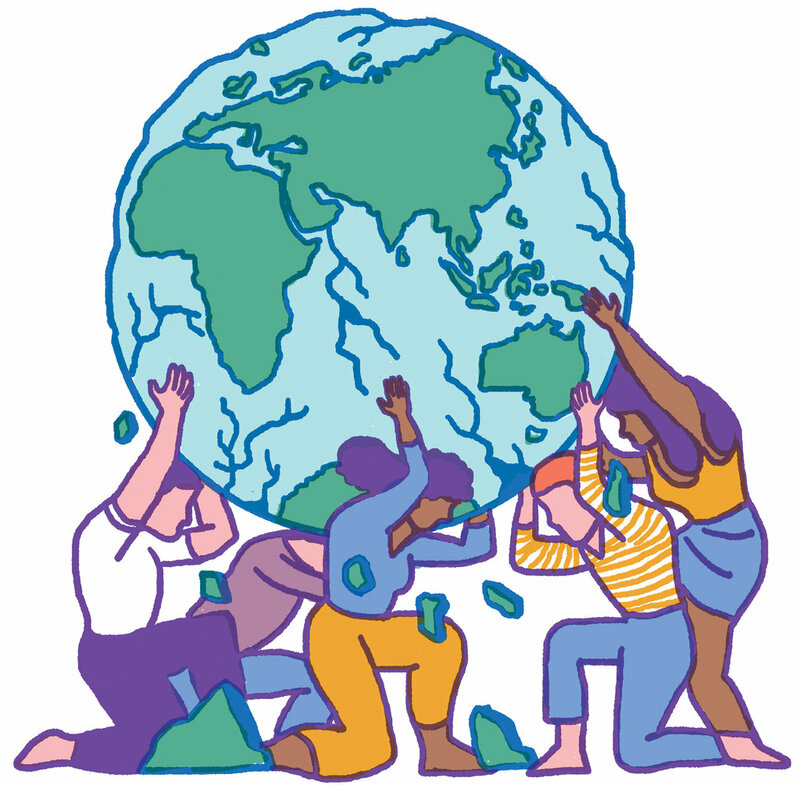 If, for example, we are going to slow the rapidly escalating dangers of climate change, halt the savaging of our oxygen-producing rainforests, and clean up our polluted rivers, lakes, and oceans, we must cooperate because the problems are bigger than one country, one corporation, one set of regulations. It’s global collaboration that will rescue the planet, not Pepsi competing with General Mills for who can burn down the most square miles of rainforest for palm oil plantations. Another pervasive assumption is that private is superior to public. Private colleges versus public universities. Private health insurance versus universal healthcare. Private transportation versus public—the subway, Metro, Tube. In the minds of many, anything privately run, i.e. for profit, is assumed to trump all public versions of the same. Nowhere is this more true than in the U.S. Returning to the States in 1984 after six weeks in Europe, I was horrified by how hard and beat up middle-class Americans looked. Heads down, shoulders hunched, a sea of scowls. Did they realize how unhappy they appeared? Did they acknowledge the toxic pressure of trying to survive in a society that values neither the social nor the public, a society that, as one friend put it, is really just a get-rich-quick scheme? Everything for a buck—it just wears people down. We could really use a break. But can we get one? Most countries, including Slovakia and Romania, have government-mandated minimums for annual paid vacation, often 3-5 weeks. The U.S. leaves the question of paid vacation up to individual employers. Paid maternity leave is another important perk mandated by all the industrialized countries—except the U.S. (although California, Rhode Island, New Jersey, and recently New York have enacted laws for this). Of the top 51 highly-developed countries, only the U.S. lacks some type of universal healthcare systems. Is it any wonder that in a list of life expectancy by country, the U.S. comes in a shocking #43? Traveling abroad, I am always impressed by the wide array of free cultural events, the vast number of beautiful parks and public gardens, available for the enjoyment of all. A society that collects and spends money for the public good has always seemed to me to have a better public, a more literate, happier, healthier people. As we in the U.S. face the prospect of losing our public lands and national parks to private companies for drilling, the closing of our public libraries and schools, the privatization of Medicare and the abolishment of Social Security, we need to take a long, hard look at this assumption that private is superior to public, and ask ourselves: Where is the evidence? That slippery slope where our assumptions cartwheel freestyle from the fact-based down, down, down into a nasty quagmire of prejudice? We’re here. Perhaps, the most pernicious—and human—assumption we make is that we are the norm. Human, because we are all locked inside our own skin. While we can (and should) empathize with others, make the effort to walk a mile in someone else’s shoes, by default the view we see most clearly, and continually, is our own. This biological/psychological tendency, however, does not make you or me “the norm.” There are 7.2 billion of us on the planet. Clearly, there cannot be 7.2 billion “norms.” And thinking we are the “norm” is dangerous because it’s a short hop from that assumption to believing who we are is the one true “right way” to be. LGBTQ people become “deviants” because one is not gay or transgender. Women can be treated as objects and denied equal rights or fair pay because one is not a woman. People of color don’t deserve access to education, jobs, or decent housing because one is not a person of color. It’s okay to rip immigrant families apart and jail their infant children because one is not an immigrant. People with pre-existing conditions can be tossed under the bus because one doesn’t (yet) have a pre-existing condition. This is too often the world we live in, and it’s not working out so well, is it? It’s easy for people who have grown up in countries untouched by war and unravaged by famine—who have always enjoyed comfortable shelter, access to healthcare, and free public schools—it’s easy for these people, which likely includes most everyone reading this, to assume that just because they’ve always had these things, this life of relative privilege, they always will. Regular readers of my scribblings here know I’m a BIG fan of history, and if history proves nothing else, it underscores the lightning swiftness with which one’s circumstances can change. Wiped out overnight with the whoosh of a tsunami or hurricane. Devastated in the space of a few days or weeks—the eruption of Mount Vesuvius that buried Pompeii, the Great Plague of 1665 that killed 100,000 Londoners, the bombing of Hiroshima and Nagasaki. Or annihilated in the slow but steady (two years, five years, ten) drip-drip of the Nazis’ Nuremberg Laws, the evictions of Jews from their homes, the loss of their businesses, and the violence of Kristallnacht as thousands, then millions of Jews, gays, Communists, Romani, blacks, and the mentally disabled were rounded up and sent to the gas chambers. CNN’s Sheena McKenzie writes of “How seven years of war turned Syria’s cities into ‘hell on Earth’”: Syria’s civil war, which marks its seventh year on Thursday, has transformed ancient cities into scenes of apocalyptic devastation… Architectural masterpieces dating back centuries have been annihilated. Bustling marketplaces turned ghostly quiet. And basic infrastructure — hospitals, schools, roads — has been pummeled into dust. Everything you have can be taken from you. Healthcare, pension, breathable air, safe drinking water, a free press—the list goes on, grows daily. And if the right to protest in Washington, D.C. is outlawed, as TheRUMP would like, the way is paved for our voices to be silenced everywhere. Perhaps the most dangerous assumption we can hold in this moment is that others will save our democracy. That we need do nothing. Someone will stop the threat—the courts or activist/advocacy groups like the ACLU, the Environmental Defense Fund, and Amnesty International. When we assume that others will take care of things, however, we run the risk that no one will. As I was doing the final edit on this post, news broke, first, of the bombs delivered to Barack Obama, Hillary Clinton, John Brennan, Maxine Waters and eight others (so far), followed by the shooting deaths of 11 members of Pittsburgh’s Tree of Life synagogue. Anyone who doubts we live in perilous times (and I mean this in the nicest possible way) needs to have their head examined, as my dear old Ma used to say. Yes, the Far Right is cleansing voter lists of blacks, Latinxs, Native Americans, and college students. All the more reason to double down.